Brake Repair. People quite often ask when do I need to have my vehicle’s brakes checked. 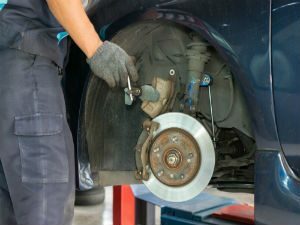 Well if you are having your car regularly serviced by a well-qualified mechanic they will always advise you if your brakes need attention. Of course, having them checked often will mean you won’t have any nasty surprises or a large bill to pay. So good maintenance is the key to keep you safe. Because brakes work on a friction base the components do wear out and also the brake fluid should be replaced every 24 Months. If when driving you to experience any of the following then you need to have your brakes checked immediately. If your brake warning light comes on. If when braking your vehicle pulls either left or right. You hear a grinding noise when you brake.